The faces may change – sometimes with regularity – but Sweden's SOILWORK has remained a remarkably steady, consistent act throughout its 20-some year career, which is testament to the guiding hand of frontman and lone original member Björn “Speed” Strid. The band's sound – built around a core of thrash/modern metal and flavored by bursts of death metal intensity, soaring melodies and classic metal/hard rock catchiness – has been refined over the years. But it has never been marred by the dramatic sonic shifts in one direction or another that have led so many other veteran acts astray, notably fellow countrymen IN FLAMES. 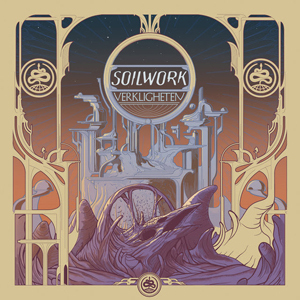 Though SOILWORK’s 11th full length, Verkligheten, is its most melodically inclined, it is not that much of a departure from 2015’s more aggressive The Ride Majestic. Indeed, the most notable change is the arrival of new drummer Bastian Thusgaard, who took over after Dirk Verbeuren was lured away by MEGADETH. And while Thusgaard establishes his presence with authority at the outset - following the obligatory atmospheric intro of the title track - by launching the aptly titled “Arrival” with a blast-beat stampede, the album soon settles into the classic SOILWORK groove, where it largely remains, with intermittent, and similarly ferocious, jolts to shake things up. “Needles And Kin”, for example, which kicks off in a wash of strings, erupts with black metal-style riffing and more blast-beat fury, as AMORPHIS frontman Tomi Joutsen adds some imposing dirty vocals to offset Strid's melodious cleans. “When The Universe Spoke” is another rager, while “The Wolves Are Back In Town” and “The Nurturing Glance” temper their aggression with the sweeping clean choruses that have become a SOILWORK staple. But following “Arrival”'s velocity and vigor, “Bleeder Despoiler” offers a medium-paced hard rocky vibe, something that is quite prominent here. The influence of Strid and guitarist David Andersson's recently rather active retro side band THE NIGHT FLIGHT ORCHESTRA – whose sound is much closer to FLEETWOOD MAC than AT THE GATES – has definitely spilled over some on Verkligheten, which isn't necessarily a bad thing. Despite its double bass-powered pace and a moment of heaving, LAMB OF GOD-like crunch at its midpoint, “Full Moon Shoals” boasts sleek, almost gentle melodies. Strid's grittier vocals on the verses of “Witan” are countered by more emphatic keyboards and a buoyant chorus, while “The Ageless Whisper” closes out with the same lilting strings that bleed into “Needles And Kin”. Even the heftier tracks here, like “You Aquiver” or “Stålfågel” - which features the barely audible Alissa White-Gluz of ARCH ENEMY on backing vocals - are tempered somewhat by the slick, clean production of Thomas “PLEC” Johansson, who has worked on the last three NIGHT FLIGHT albums. It makes for an album that is very easy to warm up to, even if it doesn't deliver quite the impact of SOILWORK's typical work. That said, Verkligheten is not lacking in metal thrills, not the least of which is Thusgaard's athletic drumming. As a student of Verbeuren's, he provides a seamless transition, steering the ship without, well, missing a beat and ensuring the energy never ebbs despite the band's more measured attack overall. And the guitar harmonies and solo tradeoffs from Andersson and Sylvain Coudret are quite glorious throughout, accenting the crafty, catchier compositions and Strid's always elastic scream and sing vocals. Johansson's gentler hand really lets them soar where more assertive approach might have lost some of the nuance.